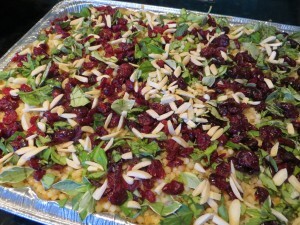 I prepared this summer salad for a high school class reunion picnic. It was a bit of a challenge to quadruple-plus the recipe, but I think the end result was a success. It’s a an easy salad that can be prepared in less than an hour; unless you over toast the couscous, like I did, and have to meticulously remove the burnt pieces. Lesson learned! 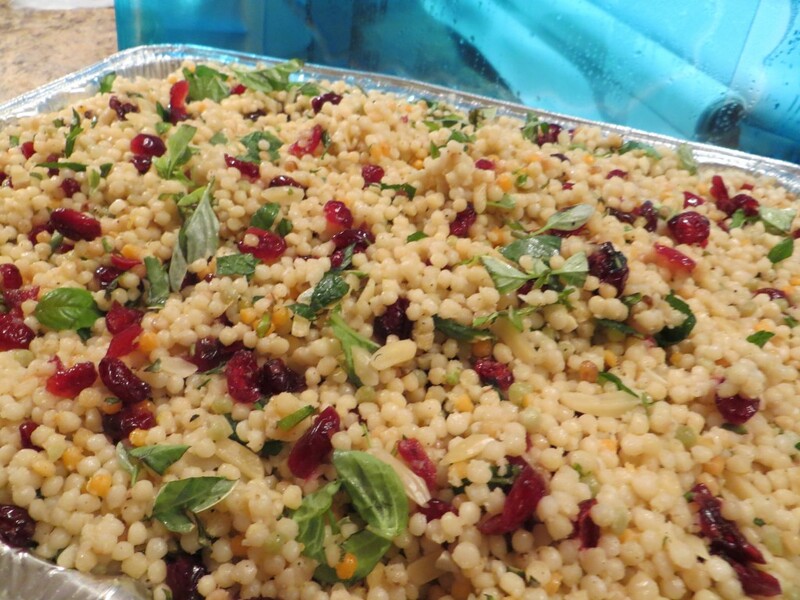 I opted to use Israeli couscous because of it’s pearl-like shape and included a couple of containers that were colored. It made a nice contrast. 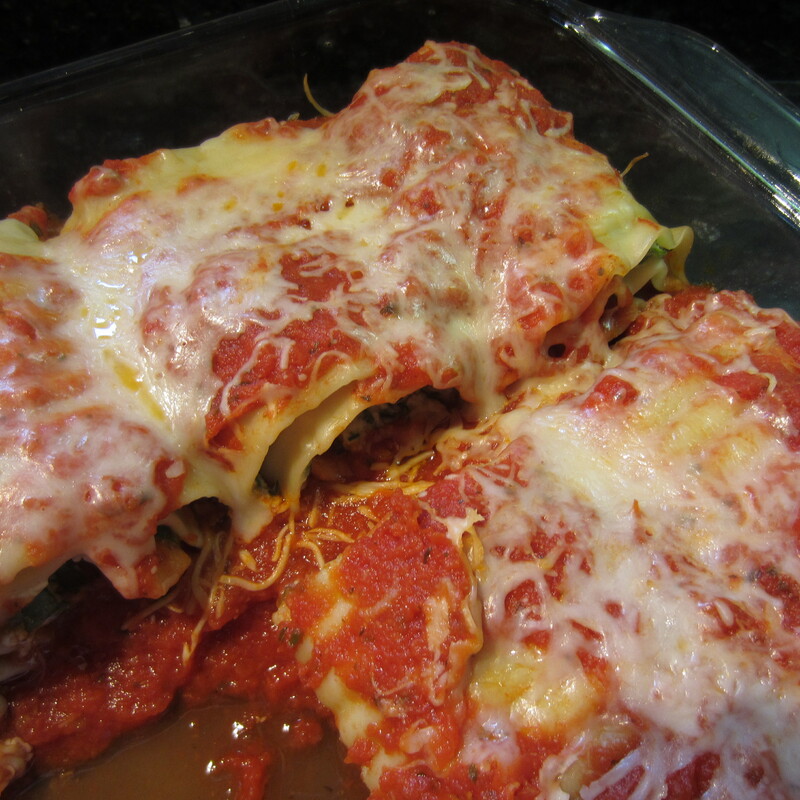 This recipe is courtesy of Giada De Laurentiis, one of my Italian favorites on the TV cooking network. I have provided the recipe for a serving of six. My upgraded recipe served 100 people; hence, the large disposable aluminum pan you see pictured. 1) In a medium saucepan, heat 3 TBLS olive oil over medium heat. Add couscous, cook for 5 minutes until lightly toasted. Stir often prevent scorching. 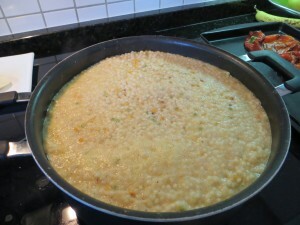 3) Drain cooked couscous and place in a large bowl. 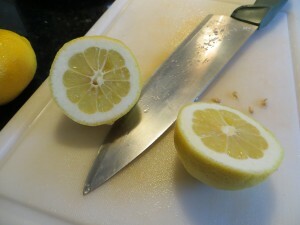 Toss with 1/4 cup olive oil, lemon juice, lemon zest and seasonings. Cool couscous to room temperature. This is VERY important. You don’t want the fresh herbs to wilt when they are added to the couscous. 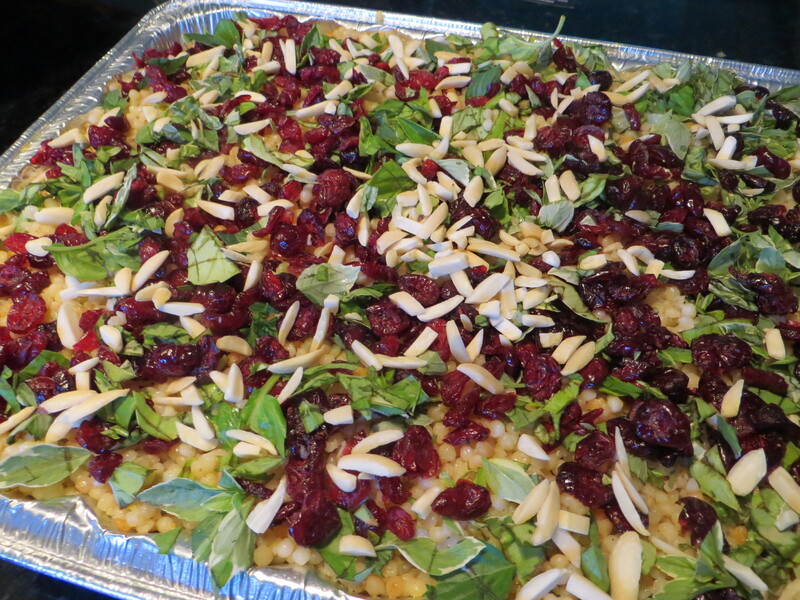 4) Once cooled, add fresh herbs, dried cranberries and almonds. 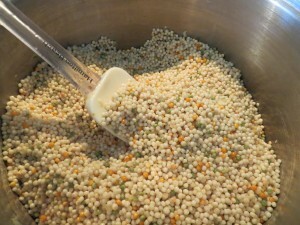 Combine and toss to evenly distribute ingredients. TIP: If making larger quantities, toss all ingredients in an unused kitchen trash bag. Once mixed, empty contents of bag into the serving container. I am trying to use up food before our trip to Italy. I had a couple of chicken breasts that I had thawed a few days earlier but never used. With the grand-kids coming for the night, this was a perfect opportunity to cook them. There were a couple of apples that were in need of rescue, so I nabbed one to use with the chicken. This is the final results of my food rescue mission. 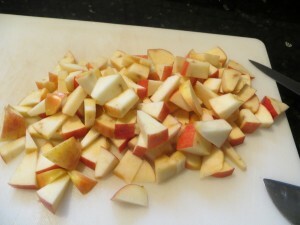 Needless to say, the grand-kids weren’t big fans because of the cooked apples. That’s craziness to me since they like apple pie. Personally, I would have used rice rather than noodles, but since the kids don’t like rice, I added pasta. 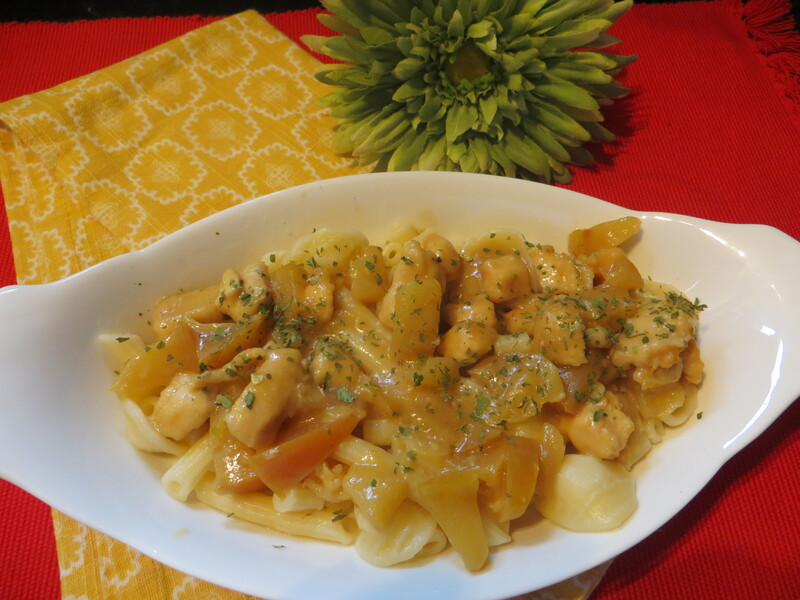 The honey mustard sauce gives offers tang and the apples a sweetness which is a perfect blend when paired with the chicken. Heat olive oil in large skillet over medium-high heat. 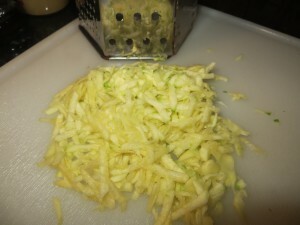 Add flour-coated cubed chicken and saute until lightly browned, then add the cubed apples and shredded zucchini. 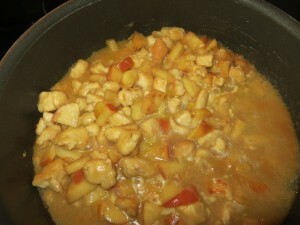 While the chicken mixture continues to cook, combine apple juice, cornstarch, honey mustard, honey and salt/pepper in a bowl. Add to the skillet. Let simmer for about one minute before adding the chicken broth. Turn heat to low, cover the skillet and simmer for 15 minutes. 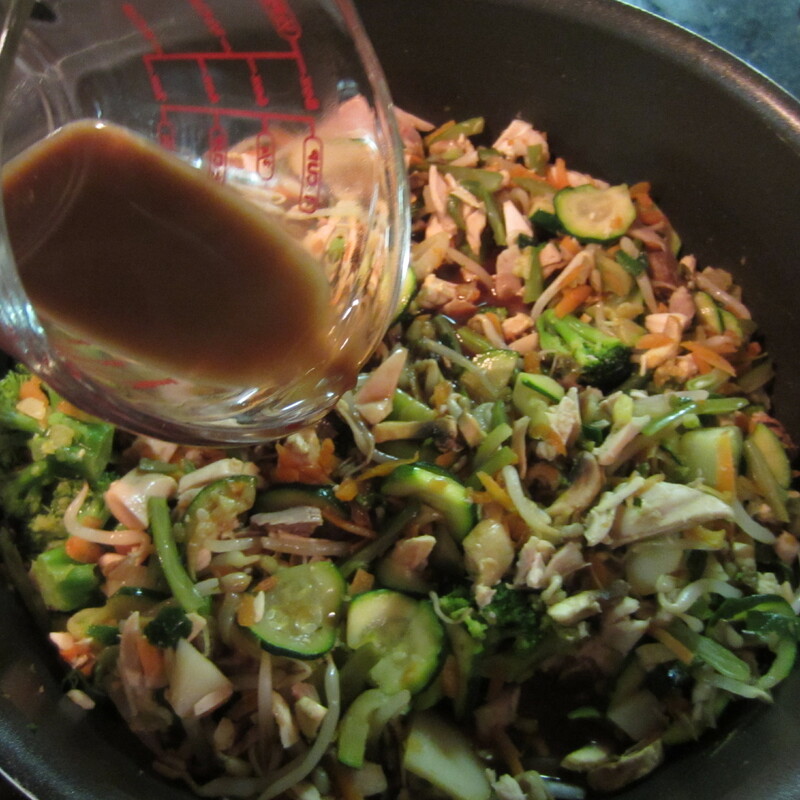 Additional chicken broth can be added if the sauce seems too thick. While chicken simmers, cook the rice. 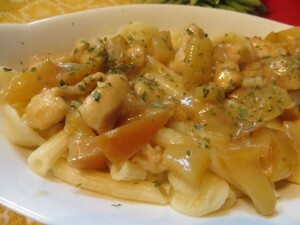 Serve the chicken and apple sauce over rice and garnish with fresh parsley. 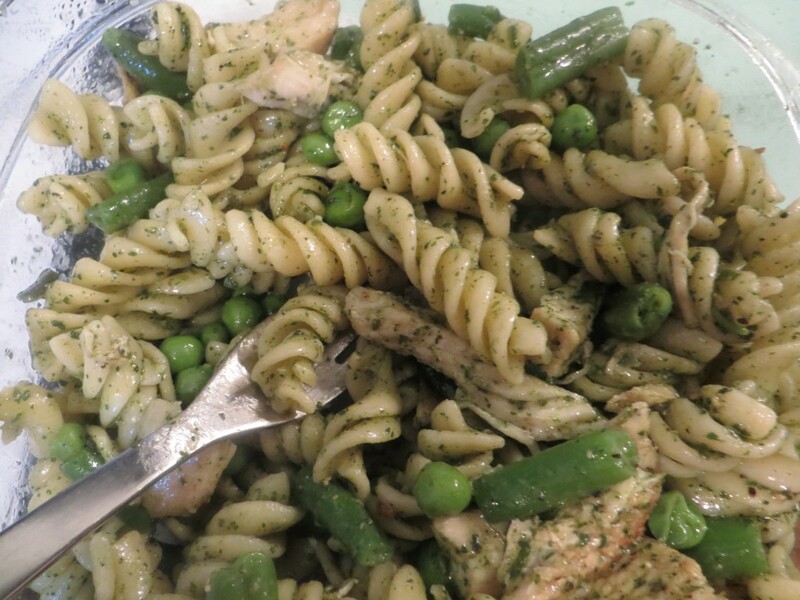 My assistant, Jenni, shared this awesome pasta salad recipe with me. It is delish and so easy to make. In this ungodly heat wave we are experiencing in Michigan, no one wants to spend time in a hot kitchen. This one dish meal is perfect for hot weather and has minimal prep time. Prepare the pesto sauce and the noodles as directed on the package. Chop chicken breasts into bite size pieces and pan sear on stove top. Cook the vegetables as directed. Combine all ingredients in a mixing bowl and serve. This dish can be served hot or cold. Add 1 tablespoon olive oil to the salad when reheating. This dish can court any season. However, in Michigan where the smell of Autumn is running rampant, this stuffed shell dish lends itself to a Sunday afternoon football feast next to a cozy fire. 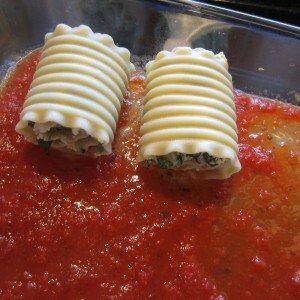 The flavorful stuffed shells are tucked beneath the cheesy tomato topping and packed with tasty goodness. Pair with an antipasto salad (low-fat dressing-pepperoni-ham-cheese, of course) and you have a meal made in sports heaven. Cook the jumbo pasta shells as directed on the box. 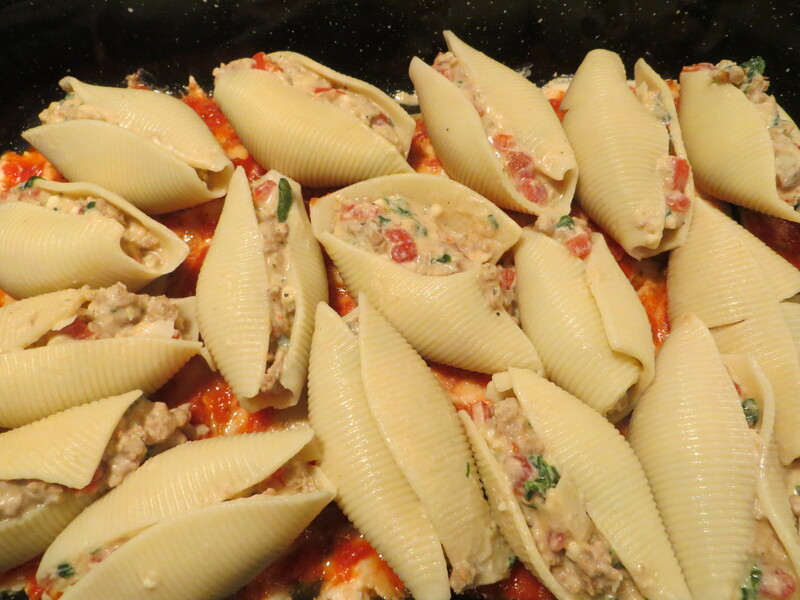 The filling recipe will stuff approximately 24 shells. 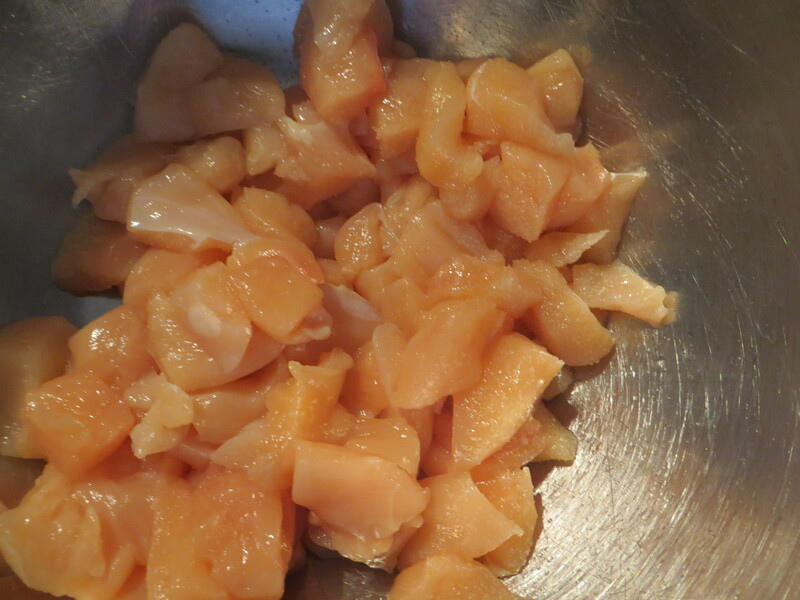 Once shells are cooked, drain the water and place the cooked shells in a bowl of ice water until ready to fill. Combine the above ingredients into a bowl. Mix well. Spoon filling mixture into each jumbo size (cooked) shell. Drain shells from the ice water bath before filling. 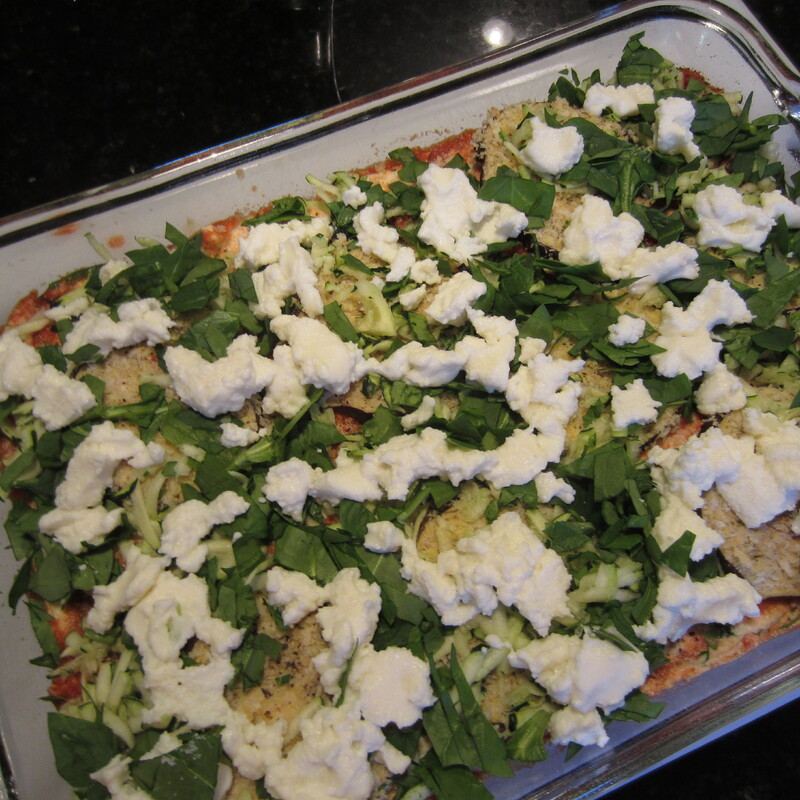 Preheat oven to 350 degrees F. Spray a 9 x 12 baking pan with non-stick cooking spray. 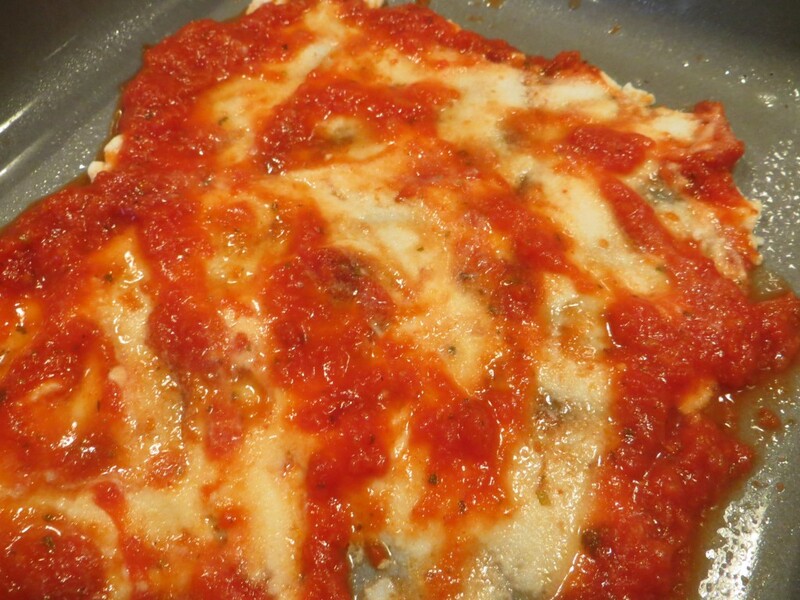 Spread a portion of the ricotta cheese onto the bottom of pan and top with a 1/2 cup layer of marinara sauce. While oven is heating, crumble and cook the turkey meat in a large skillet until browned. Add the filling mixture to the browned turkey meat. Remove from heat once ingredients are warmed through. Stuff each shell with the filling mix and place into the 9 x 12 baking dish. Cover the shells with the remaining marinara sauce. 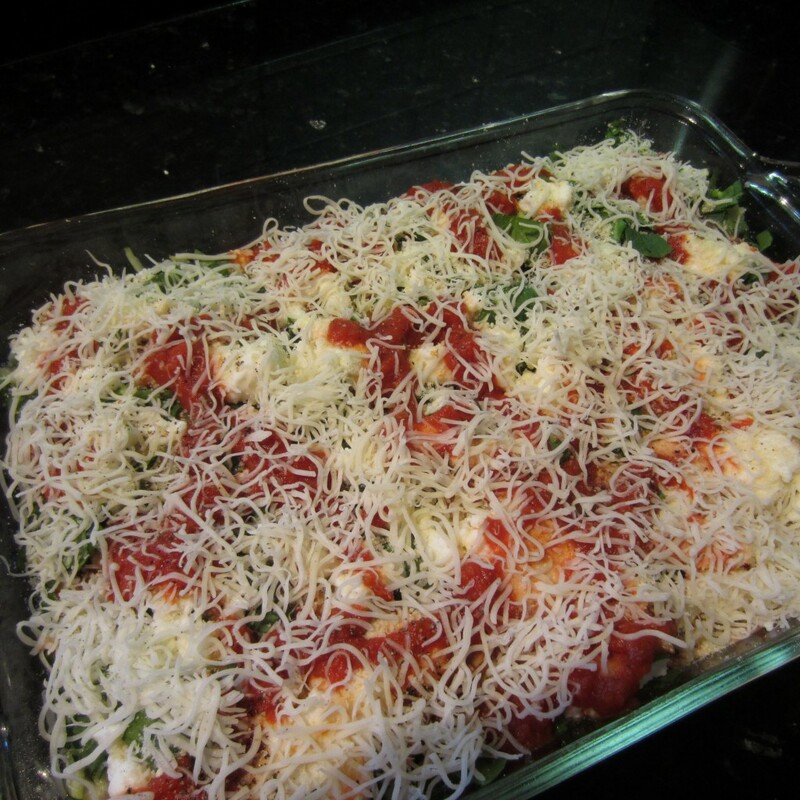 Sprinkle with 1/2 cup grated low-fat mozarella cheese. Cover and bake for 30 minutes. Remove from oven and let stand 8 minutes before serving. 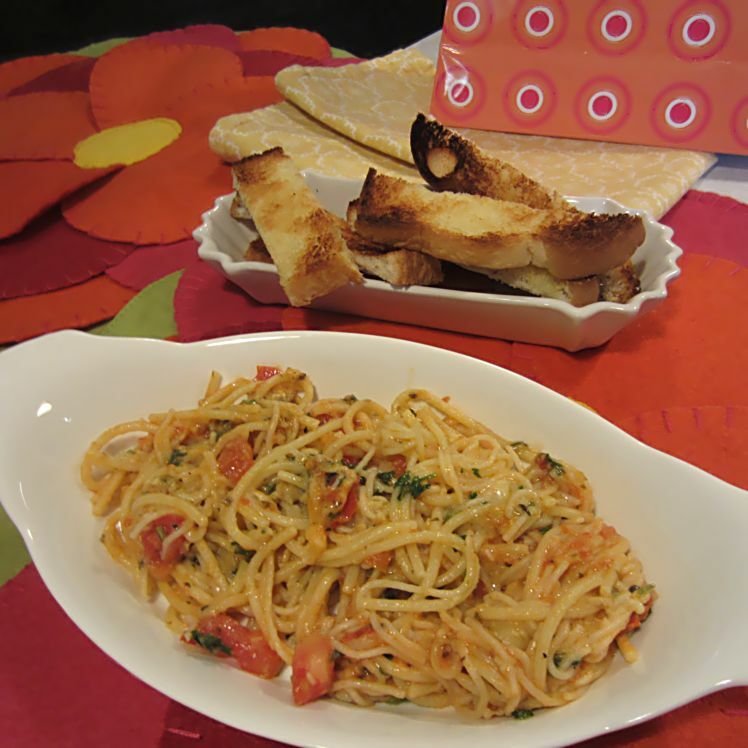 This recipe will easily serve 8 people when served with an antipasto side salad. Each stuffed shell is in the neighborhood of 91 calories. There was a brief chill in the air last week. After 80 plus degree weather, a 60 degree day felt like Fall. I decided to make my Blimpy Girl Goulash for dinner. A slice of hard crusted bread spread with low-fat buttery goodness completed the dish. It was great dish to eat while curled up on the sofa (with a soft comforter and glass of red wine) watching a Netflix movie. I was in heaven. Ok, let’s start with the name of this dish. Why Goluptious? First, it’s fun to say. 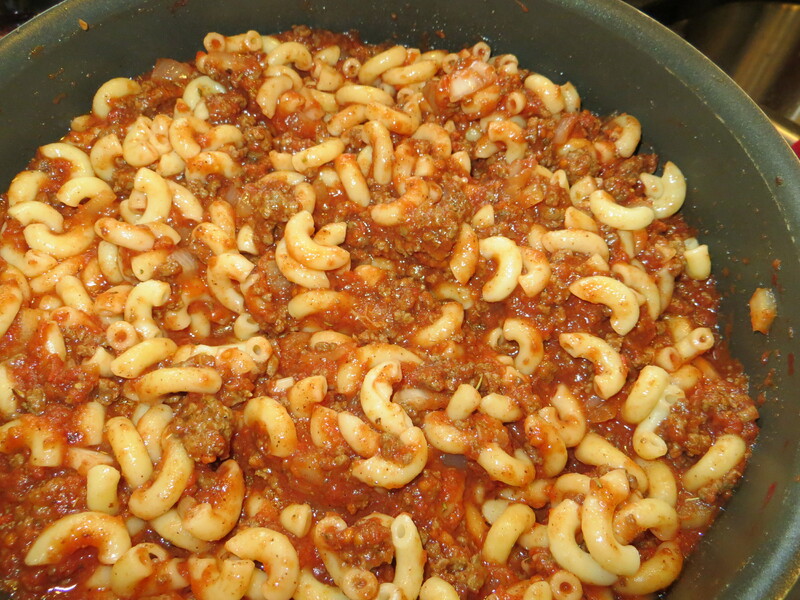 Additionally, the word means “delightful, luscious” and that is exactly how I would describe this easy-to-make goulash dish. I’ve never been a big fan of goulash, but I give my seal of approval on this one. Maybe it’s the added zip from the ground red pepper. Even the “wine guy” had two helpings. 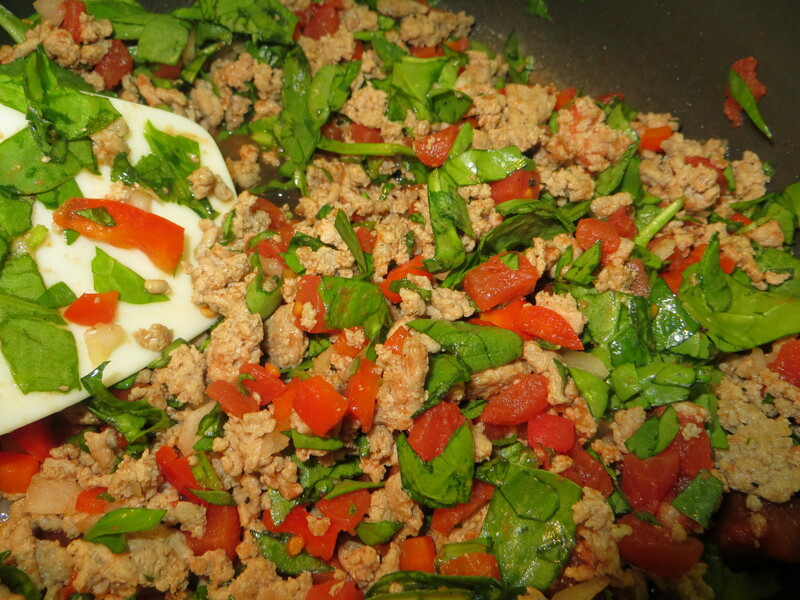 Ground sirloin is the best meat to use since it is very lean. I didn’t even have to drain the cooked meat. ***Big Smile***. Of course, whole wheat elbow macaroni is a better choice if you can find it. I used standard elbow macaroni in my recipe. Whole wheat will lower calories/fat intake. Here’s the easy-peasy recipe (that’s what my grandson calls all things he believes to me easy). 1 to 1/4 pound ground sirloin beef, cooked, drained. 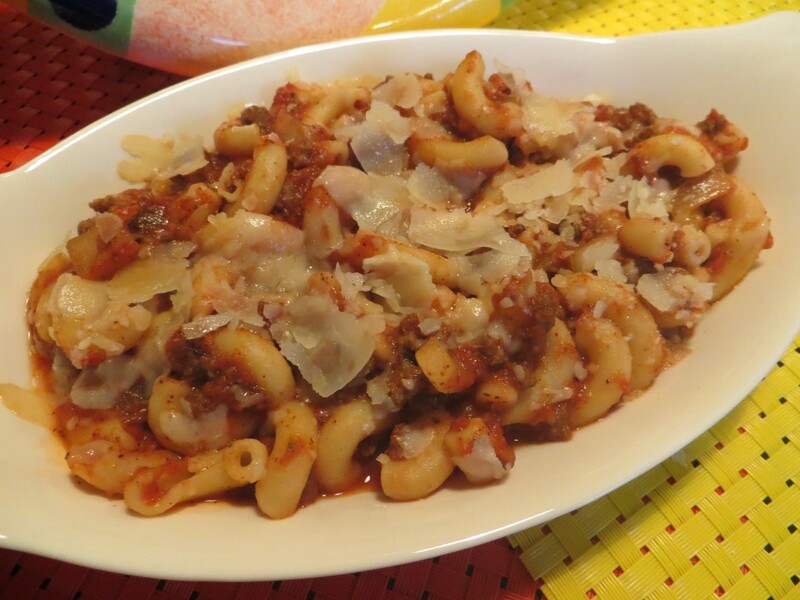 3 cups elbow macaroni (pre-cook per package directions). Rinse and drain. 2 pinches of red ground pepper (about 1/8 teaspoon). Use more if you like a spicy zing. Crumble ground sirloin into a Dutch oven pan and cook over medium-heat. Add chopped onion and minced garlic once meat has started to brown. Drain off any excess grease. 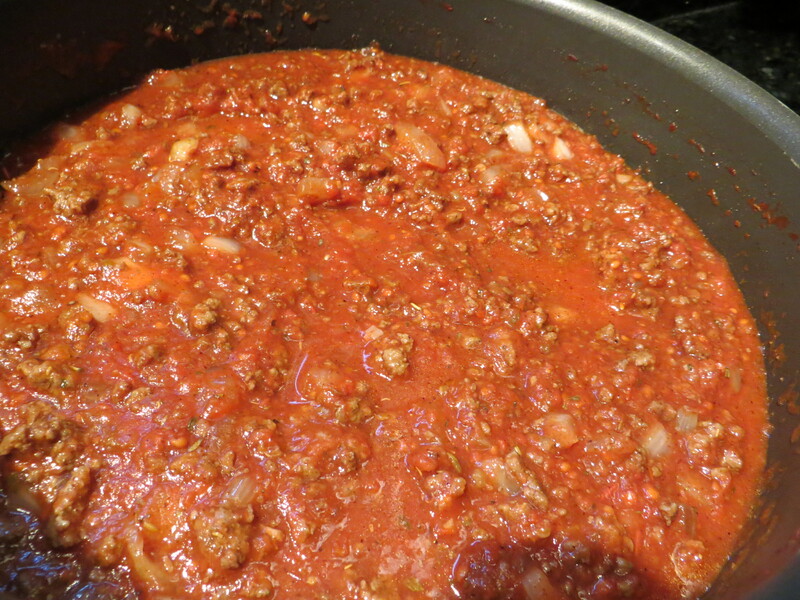 Add crushed tomatoes, seasonings, vinegar, water and noodles to the meat mixture. Bring to a boil, reduce heat and simmer for 20 minutes. Stir occasionally to prevent burning. 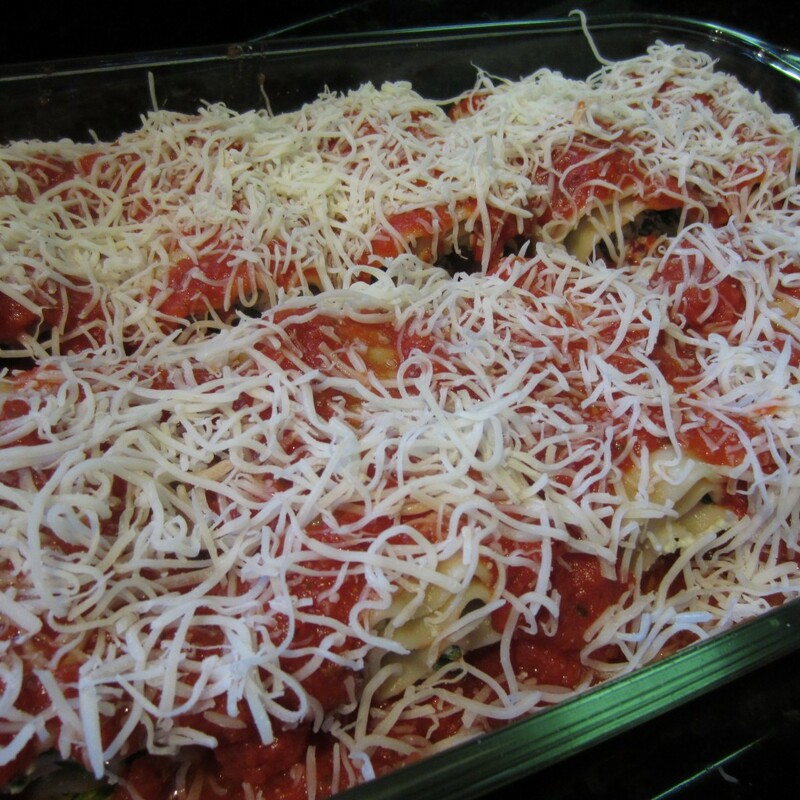 Sprinkle grated Parmesan on top of each serving. Makes (8-10) one cup servings. Add 1/2 cup more water if to ensure a serving for 10. Hard crusted bread with low-fat butter/margarine is a perfect match for this hearty dish. Now for the calorie count. A one cup serving is in the neighborhood of 155 calories. Add a slice of hard crusted bread… another 90 calories. A pat (1 teaspoon) of low fat butter is only 30 calories. An incredible meal for well under 300 calories. Add a yummy green side salad and you will still be around the 300 calorie mark. As usual, I had a few food items that needed immediate attention. A partially cut tomato, fresh parsley, and an open jar of marinara sauce were shouting an SOS from the refrigerator. 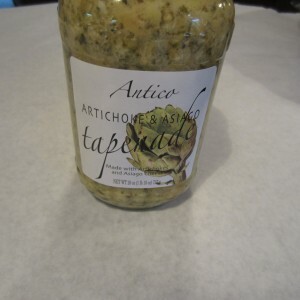 When I spotted a jar of Artichoke Tapenade in the pantry, I knew a pasta dish was on the dinner menu. Tapenade is an olive oil based paste. There are many variations with chopped olives and garlic being a mainstay. However, the purchased tapenade I used for this dish contained artichokes instead of olives. Tapenade is considered a condiment and most often spread on toasted bread or sandwiches. 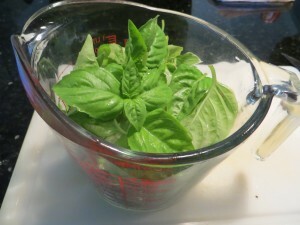 Adding a few tablespoons to pasta sauce can really jumpstart the flavor. I elected to use spaghetti noodles, but any type of pasta can be used. 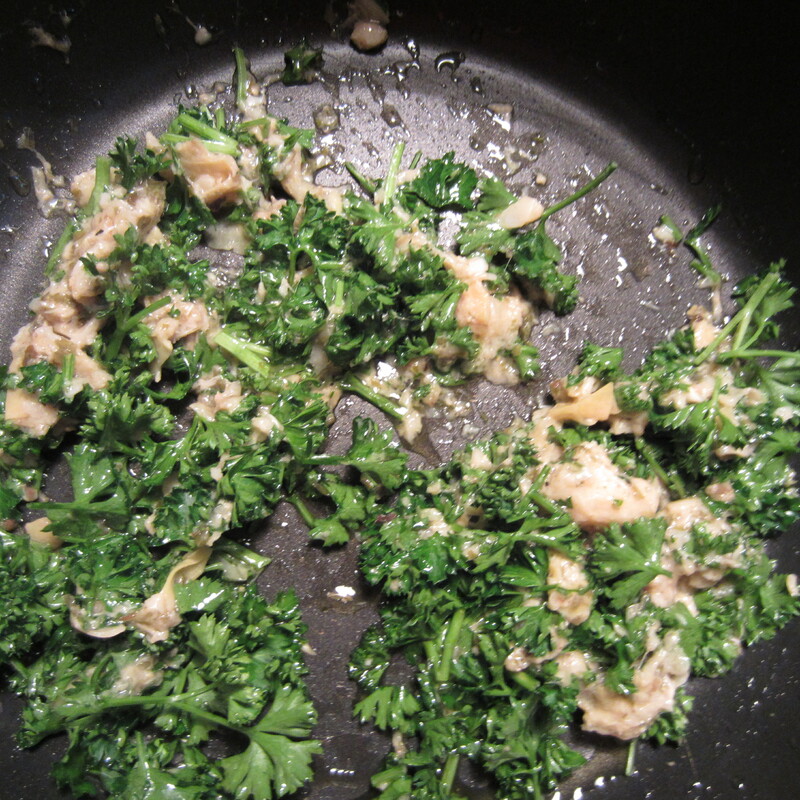 Artichoke tapenade mixed with parsley and olive oil. Cook pasta as directed on package. 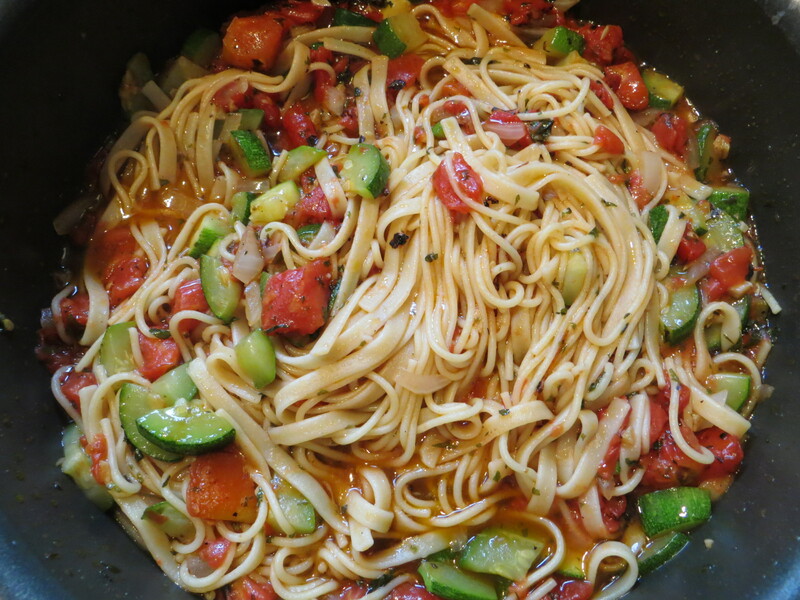 Drain water and return pasta to the cooking pan. Toss the remaining ingredients into the pasta and serve. This recipe makes three 1-cup servings. Each serving is in the neighborhood of 292 calories. 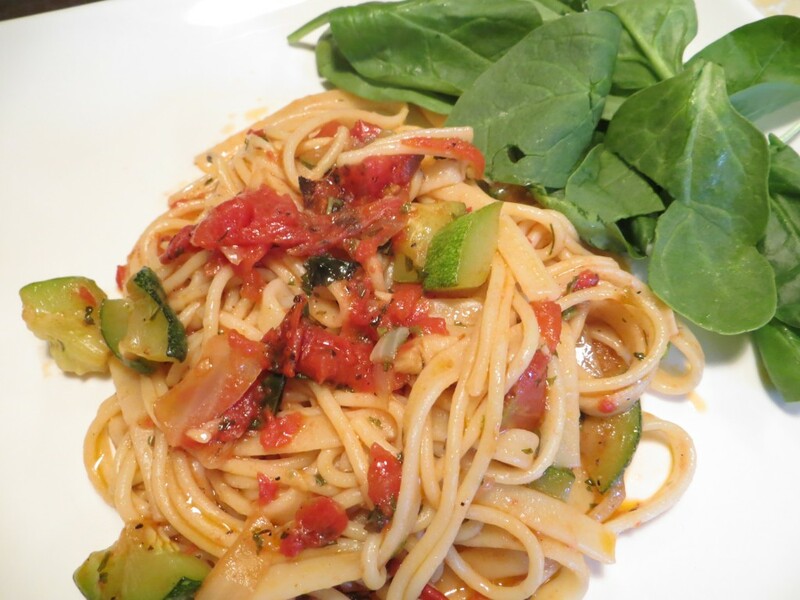 You can shave off 45 calories by using whole wheat spaghetti, and it’s good for you! That puts a one cup serving at just 247 calories. Add a tossed salad or side of steamed broccoli and you’re still under 300 calories. 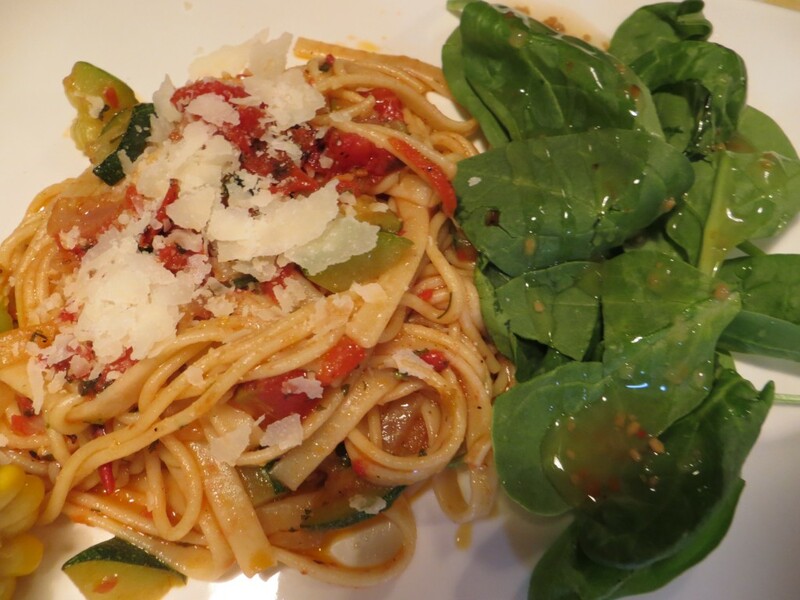 This dish is quick to prepare (I keep cooked pasta in my fridge so it’s ready in a pinch), filling and very flavorful. I skipped the side dishes and made garlic toast instead. 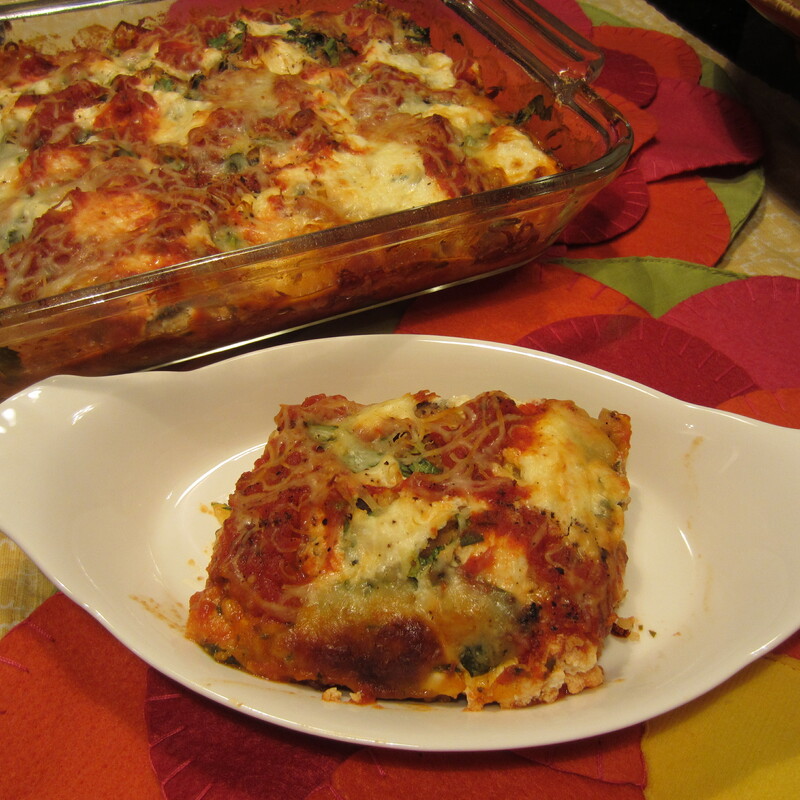 Gooey cheese, fresh spinach…did I mention gooey cheese? Yes, it’s meatless, but I don’t think you will miss it. I made ten roll-ups last night and they have vanished. My family devoured them shortly after their oven departure. The feedback from the partakers is positive. This meal can easily be prepared in advance. 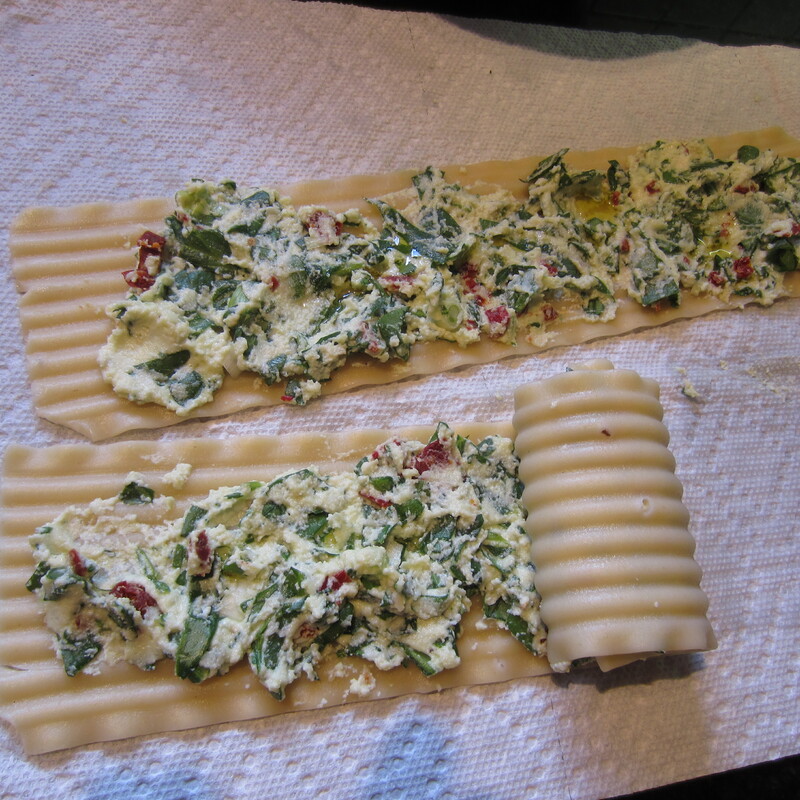 Cook the lasagna noodles, drain and let air dry on paper towels to remove all moisture. Roll up and store in a zip lock back until ready to use. They will keep in the fridge for several days. 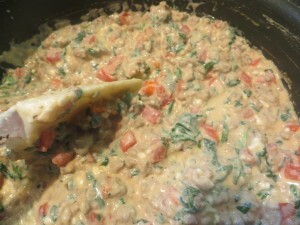 The filling can be made in less than 15 minutes. Baking time for the roll-up is 35-40 minutes which allows time to prepare side dishes. Quite honestly, this is a stand-alone meal. If you want sides, I suggest hard crusted garlic bread and cooked asparagus tips drizzled with (good) olive oil. 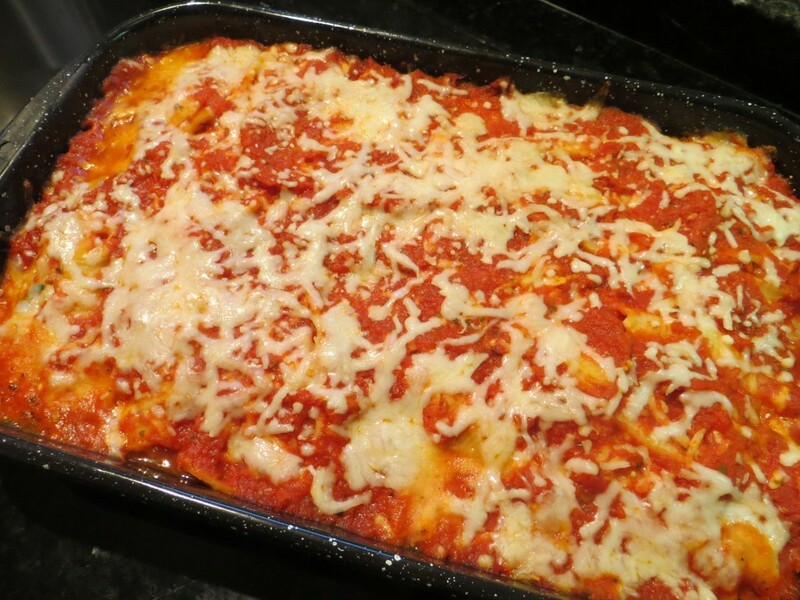 Serve the asparagus as the first course and lasagna/garlic bread as the second course. Give thought to how you plate each course, be creative. My post dinner choice: Biscotti and dark roasted coffee. Offer no-fat coffee flavorings as an option. I will have the recipe posted this evening. Since the Blimpy Girl web site does not bring home the bacon, I have to rush off to my “real” job. I’m sure many of you can relate. What an incredible dish. Eggplant Parmesan lasagna minus the pasta. It’s filled with vegetable goodies and yummy cheese. What’s not to like? Dollops of low-fat ricotta cheese bring added flavor. The email I received from my daughter yesterday says it all, AWESOME!!!!! This was her lunch. Apart from inclusion of water chestnuts (a texture thing for her), she loved it, as did my honey-man. He even took a bowl for lunch today. 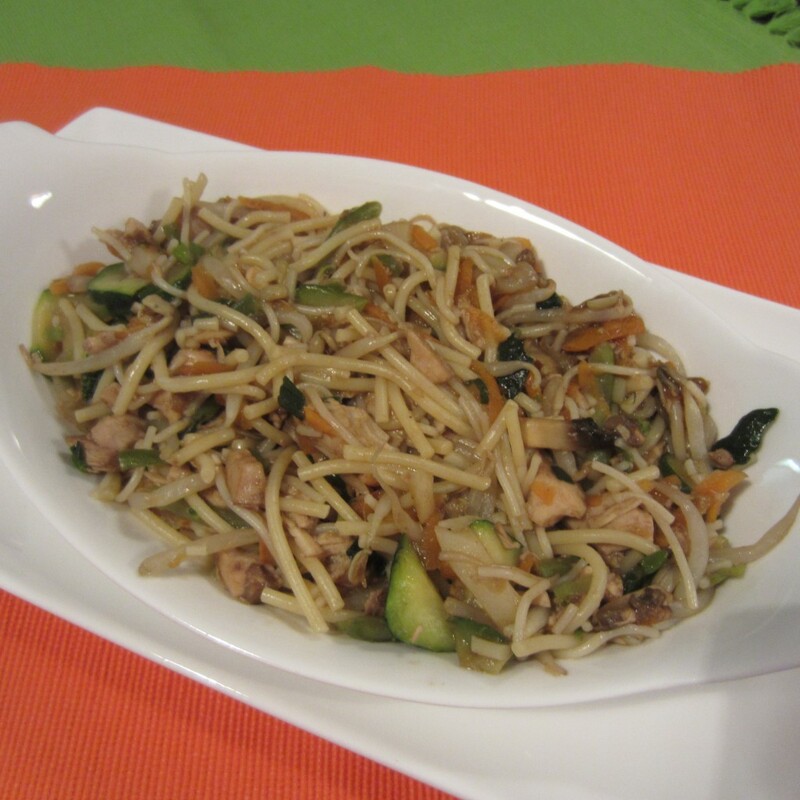 Either cooked spaghetti, angel hair pasta or rice noodles can be used in this recipe. I only had enriched spaghetti in the pantry, so that was my choice. 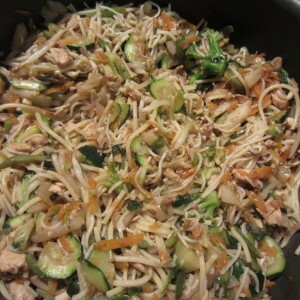 Rice noodles are lower in calories and a good choice if you’re looking to shave off even more calories per serving. Veggies include carrots, zucchini, mushrooms, scallions and bean sprouts. For added flavor substitute the button mushrooms with a chopped portabella mushroom. The best part is the sauce and it’s so easy to make. Pour sauce over cooked Lo Mein. If using pre-cooked rotisserie chicken (which I did), you can prepare this meal in about 25 minutes. Just be sure to remove the skin from the breast meat. In hindsight, I should have served each portion in Chinese take-out containers. I happened to have a few left over from a soaping project.